Author: Bernd Heine, Christa König. Series edited by: Rainer Voßen. The !Xun language – or as proposed by some researchers, the !Xun language family – consists of a wide variety of dialects that spread from central Angola to northern Namibia and northwestern Botswana. It is considered part of the Khoisan language family and as such shares some lexical and grammatical forms with other South African Khoisan languages. It is, however, unclear whether these similarities stem from a genuine genetic inheritance or merely are a product of language contact. In fact, intelligibility even among the !Xun speakers is fairly low. !Xun speakers of central Angola do not understand !Xun speakers of eastern Namibia and vice versa. Yet clearly defined language borders are not to be found. Therefore all 11-15 dialect forms, depending on the source, must be seen as part of a single, if complex, language. This work is based on (1) the analysis of existing publications, (2) the data of the field research carried out between 2000 and 2008 in various parts of Namibia. 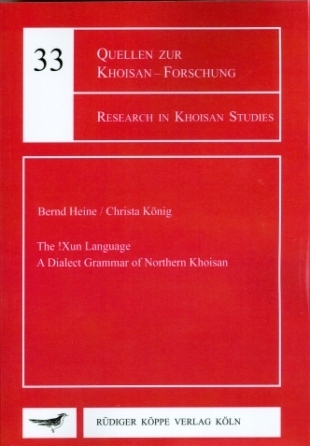 One main goal of this work is to offer a dialect analysis of the grammar of !Xun, especially since for most dialects there is so far no grammatical information. The fact that the authors will be dealing with eleven different dialects and that the book is divided into eleven chapters is no more than a coincidence. The approach they are using is comparative rather than monographic in nature, but the data are presented in such a way that the reader interested in one particular dialect will have no problem in finding the relevant information for this dialect. The grammatical information presented in this book are: (1) generalizations on the language as a whole, applying to all dialects, (2) linguistic features that are characteristic of one single dialect or group of dialects only. The present work thus differs in one important aspect from standard works of grammatical description: rather than being restricted to one specific dialect or standard variety of some kind, an attempt is made to include all varieties of the language in the analysis.